I’ve been watching a lot of Doomsday Preppers and now I want to write an Apocalypse story. What seems more likely/worrisome: aliens, robots, or a plague? One of the things I find most difficult about writing is trying to figure out how much detail to add. Different stories require different levels of detail, and it can be difficult to determine whether a story requires more or less details. It’s also difficult to determine where the detain should be and what it should describe. Are the pants important enough to the story to describe what they look like? What about the scenery at this moment? Does this read like a science fiction story or a literary piece? Should I focus less on dialogue and more on description? Do I have the right balance? All of these questions plague me when I write. I’ve been working on a few writing exercises lately to try and get myself back into the flow of writing. The two I’ve been focusing are fairly similar: In the first one, take the letters of the alphabet and mix them up, then write a story using each letter in the order you have them without adding anything to it. In the second one, write a 25 word poem or a 50 word prose using only words that begin with the same letter. What writing exercises do you use to get yourself writing? I thought I’d do something a bit different today and talk about a painting I like. 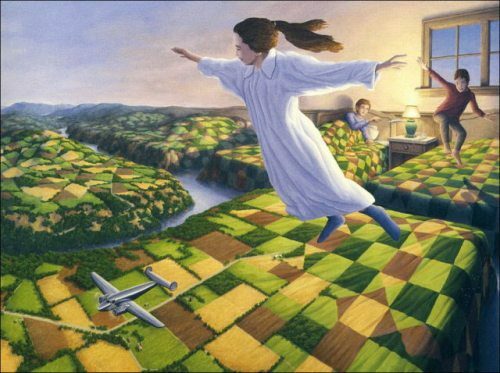 I chose the one above by Rob Gonsalves. I like this paining because it demonstrates the imagination that people are capable of. I can imagine a group of children who were sent to bed by their parents or caregivers. Two of the children start jumping on the bed as soon as the children are alone. One of the children then creates a game and a world without much thought. She has determined that she is now flying through the sky and there are fields below her and hills around her. It’s the kind of thing that most children do, but that society tries to eliminate as quickly as possible. Bree groaned as she opened her eyes. She turned her head towards the closed curtains to see that there was no light shining through them. She pulled herself out of bed and went to the window to look outside. “It’s still dark out,” she complained. Bree sighed and hurried into the bathroom. She quickly brushed her teeth and washed her face, then she threw her tooth brush and face wash into her toiletry bag. She put her toiletries into her suitcase and walked into the kitchen in her pajamas. “I’m ready,” she announced. Don looked Bree up and down. “You’re not dressed yet,” he said. Don gave Bree a skeptical look, but said nothing. “What do you want for breakfast?” he asked instead. Bree sighed, but did as she was told. She had just finished packing the bags when her parents came outside. “Ready to go?” Don asked. “Yup,” Bree relied. She climbed into the backseat and immediately wrapped herself in the waiting blanket. “See you later,” she said as she lay her head on her pillow and closed her eyes. “Brat,” Don said as he started the car. How Would You Create the Universe? Or rather, how would you write about the Universe’s creation? What would that story look like? And why? Coming up with ways to destroy the Universe, or at least the world, is easy. But creating it seems a lot more difficult. However, it also seems more interesting to me. We all know the writing advise that goes around. For the most part, it’s always the same: write every day, bad writing is better than know writing, read a lot, watch movies, show don’t tell, etc. But what about when that advise isn’t possible? What about when you just can’t do it? I can’t just make myself write. I’ve tried, but I get about six words out, then I erase it and write six different words only to erase that. The more I try to push myself, the more frustrated I get. I end up unable to even put six words on paper. In the end, I have nothing written. Is that really better than waiting until I have something to write? It seems silly to frustrate yourself and risk losing your interest in writing when you could just give yourself a day off. Stephen King says he makes himself write 2000 words a day. But he also publishes numerous novels a year. Most authors only publish one book a year. Some don’t even do that much. George R. R. Martin is a well-known and loved author, but he’s been writing the latest Game of Thrones novel for years. So why are we told that our success lies in our ability to write everyday, even if it’s crap? Personally, I’ve been struggling with my writing lately. I want to keep trying to get published. I have an entire plan set up for May-August, but I can’t even get myself to care about writing. I’ve been having a hard enough time caring about life in general. Right now I need to worry about my mental health, but I really want to write too. I miss my passion for writing. So what happens when the writing advise doesn’t work?